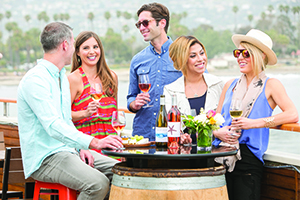 Welcome to the Deep Sea Wine Tasting Room, home of Conway Family Wines - located on Stearns Wharf in picturesque Santa Barbara, California! Our newly renovated space features 360 degree views of the Pacific coastline, Channel Islands, Santa Barbara Harbor and the Riviera. We offer Two Wine Tasting Flights, all of our wines by-the-glass and also by-the-bottle. A handpicked, seasonally influenced selection of our 5 most popular Deep Sea Wines, featuring 2 White selections, a Rosé, and two Reds. All are locally grown and produced in Santa Barbara County. A superior selection of Red Wine from our Conway Reserve label. This flight of 5 Conway Wines showcases Pinot Noir from the critically acclaimed Sta. Rita Hills, and world class Cabernet Sauvignon from the Santa Ynez Valley. The Tasting Room is open 7 days per week, and is available for Private events and Receptions. Reservations are not required, but are recommended for groups of 8 or more. We cannot guarantee outdoor seating for reservations. To make a reservation, or inquire about Private Events, please email taylor@conwayfamilywines.com or call the Deep Sea Tasting Room at (805) 618-1185. There is no better place to sip and savor Conway Family Wines all while taking in the breathtaking views from our outdoor deck overlooking the Pacific Ocean. We hope to "Sea You Soon!"